Tuscany can be compared to an amphitheater with beautiful scenery. Traditions of distant Middle Ages are often revived here in the form of festivals and holidays. One of them is held in the Italian city of Arezzo, Tuscany. The so-called Saracen Tournament, “Giostra del Saracino”, is organized in Arezzo annually. It is held on the third Saturday of June and on the first Sunday of September. The Saracen Tournament has a long history. The contest held on the 6th of August, 1535 is mentioned in the old papers of Arezzo. The tournament was dedicated to the patron saint of Arezzo, Donatus a martyr. The history has preserved an interesting fact of the contest; the winner was awarded with purple satin cloth eight lance long. No doubt, “Giostra del Saracino” has even older traditions. It is likely that Giostra is connected with the Crusades and training for them. As it is, the task to pike a spinning puppet standing for a Saracen is a typical training exercise for knights. However, later it turned into a really spectacular show. During centuries, the tournament has been undergoing changes, gaining and loosing its popularity. “Giostra del Saracino” got new life in the year of 1931, and has been held annually since that time. The only exception was made during the years of World War II. The Holiday, revived at the beginning of the 20th century, has preserved the features of the 16th century. On the day of the tournament colorful pageants in historic costumes are organized. More than 300 people dressed in the fashion of the 16th century take part in the procession. 31 horses trot around the streets of Arezzo. Their riders bear colorful flags. The tournament starts with a ceremony. The bishop blesses the knights form the steps of the Cathedral. The concert and choir songs follow. The final signal for starting a competition is given by the master of ceremonies, called maestro del Campo. Eight people participate in the tournament. Each district of the old Arezzo is presented by two knights. All participants are dressed in the colors of their districts. As soon as the master of ceremonies gives a signal, a knight starts trying to strike a spinning circle which stands for an enemy. The winner of “Giostra del Saracino” is awarded with the “Golden Lance”. Besides, there is some more stimulation for victory. A ball with spears is attached to the spinning circle, punishing an unlucky knight for a slip. “Giostra del Saracino” is a spectacular show, which gets you back to the distant past with its remarkable traditions and culture. Arezzo invites you to the holiday. You can’t start describing Arezzo without having described the capital of province which gave her this name. Middle age traditions have found new life here. Twice a year the citizens of the city hold a procession in the streets with jugglers and equestrian shows which ends with the tournament of middle age knights. 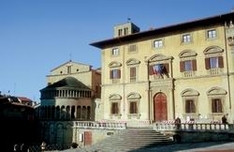 The Archeological museum in Arezzo keeps the memory of the ancient times. It was named after Maecenas who’s name became a common name for all the patrons of art. The collection of bronze statuettes found in excavations of necropolis Poggio del Sole and outstanding ceramics (I BC – I AD) are the most famous exhibits in the museum.